Guests who visit Walt Disney World should definitely choose to stay at a Disney Resort. With over twenty options to choose from, guests are sure to find the perfect resort no matter what their preferences are. Disney Resorts fall into one of three categories: Deluxe (being the most expensive), Value (having the best rates), and Moderate (falling somewhere in between). No matter which category a guest chooses, every Disney Resort features a unique theme around which all of its buildings, scenery, and amenities are based. Guests staying at a Walt Disney World Resort can find themselves in New Orleans’ French Quarter, turn of the century Atlantic City, the South Pacific, the various decades of the 1900s, or a Victorian resort. What makes each Resort so amazing is the intense attention to detail which carries through décor, artwork, architecture, dining experiences, and landscaping. Amid all of these great details are tons of hidden secrets which many guests might not realize. Here are the five best secrets about Walt Disney World Resorts for guests to find on their next Disney vacations. 5. The Five Legged Goat – Disney’s Contemporary Resort is located on the monorail loop right next door to the Magic Kingdom. Featuring a modern theme, the Resort showcases a sweeping atrium through which the monorail actually passes. While there are plenty of great details and artwork throughout the resort, there is one piece in particular which always amazes guests. Spanning from the floor of the atrium up several stories is a massive mural created by Imagineer Mary Blair. Blair is also well known for her whimsical style which is prominently featured on the It’s A Small World attraction in the nearby Magic Kingdom. The mural in the contemporary showcases an array of humans and animals on a colorful landscape. Guests who look closely at the mural might realize that one animal in particular seems a little different. One of the goats high up on a rock in the mural has five legs instead of four! This was an intentional addition by Mary Blair who felt that it was important to demonstrate that nature isn’t perfect. 3. Long Lost Waves – Disney’s Polynesian Village Resort sits on the shores of Seven Seas Lagoon and transports guests to the serene island of the South Pacific while remaining in sight of the Magic Kingdom. Guests who stay at the resort are treated to an enjoyable island feel including swaying palm trees, relaxing hammocks, and pristine white sand beaches. Many guests who enjoy time on the beach might not know that when the resort opened in 1971 a wave machine was positioned on the floor of Seven Seas Lagoon. Imagineers wanted gentle waves to lap up onto the beach making it seem like a real ocean and not a man-made lagoon. Unfortunately, the waves quickly caused unwelcome erosion on the beaches so the machine was turned off to remain dormant on the floor of Seven Seas Lagoon. 2. A Worldly Hidden Mickey – Disney’s Yacht Club Resort captures the elegance of a yacht club in New England through nautical details and seaside architecture. Guests who stay there are treated to a relaxed yet upscale experience and access to the awesome three acre Stormalong Bay water area. While enjoying the details in the lobby of the resort, guests can spot a large globe featuring maps that look to be age after many years. Guests who look closely off the shores of Africa will notice a sea monster as well as a classic blue Hidden Mickey in the water! 1. A Tropical Hidden Mickey – Guests staying at or visiting Disney’s Polynesian Village Resort love spending time in the Great Ceremonial House which serves as its lobby. Inside the building are shopping locations, the Kona Café Restaurant, ‘Ohana, and front desk. In the rear of the lobby on one side is a massive staircase which leads to the upper level of the building. Along the wall leading up the staircase are tons of bamboo pieces which give the area a tropical feel. 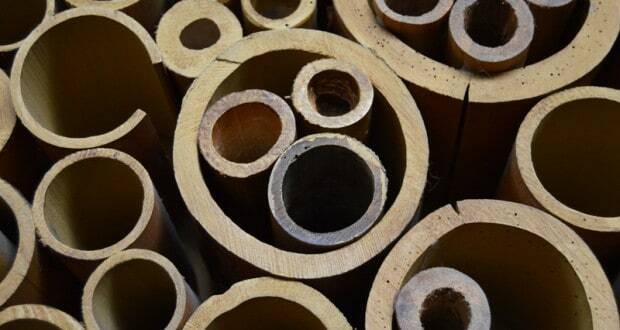 Guests who look closely while passing by the bamboo will notice three pieces which are placed together to form a classic Hidden Mickey!